In 1977, my grandfather, James D. Audett died, at the age of eighty-five, in the suburbs of Chicago. At his funeral, I met his cousin, Yvonne Goulet Cunningham. For me at that time, family history was just a set of stories and relationships I kept organized in my head. Yvonne told my sister Dee Dee and me that she had documents about the Audett family tree, and later, Dee Dee and I went to visit Yvonne and to make copies of the documents. Québec. The family had ended up in Seattle, Washington in the 1910s, where my grandfather, who worked on a ship at the time, had married my grandmother and started his family. I was sketchy on how I was related to Yvonne or what the family tree would be. When we met with her, the family tree turned out to be extremely detailed and to go back a long, long way. The Audetts of Seattle were descended, it turned out, from Nicolas Audet and Magdeleine Despres, who were early settlers on the Île d’Orléans near Quebec City, and they had come there in the mid-17th century. For someone whose longest view into family history was to know simply the name of his great-grandfather, or maybe, his great-great-grandfather, this was a mind-opening experience. It turned out that all the research that Yvonne gave us had been done by a lady named Joanne Audett Griffin, who was yet another cousin in Seattle, the great-granddaughter of a brother of William Audett. It turned out as well that the Quebec church records of family events – births, deaths, marriages -- had been very accurately recorded since settlers had first come there. Yvonne was my grandfather’s first cousin, the daughter of his father’s sister, Mary-Louise Audet Goulet. Yvonne had married another of my grandfather’s first cousins, Joseph Henry Cunningham, the son of his mother’s brother. That introduction to genealogy was all that I needed to become interested in it. I kept the Audet records, added to them everything I knew about my other ancestors, and augmented them over time. When I was a younger man I spent a lot of time asking family members about what they knew about their relatives, and writing it all down. I think this is the first step to doing genealogical research. Whatever they remember from their childhood and later life, no matter how small or insignificant, might prove to be important later on. These days the available means of doing genealogical research are so much wider than they were even a few years ago. In the United States, the censuses have all been copied, indexed, and put on the Internet, and many other pieces of primary source material are also readily available to anyone with a computer and an Internet connection. I really think, however, that whatever research we do using those tools has to have started with the caring and curious questions we asked parents, cousins, uncles, and aunts about our own families. The family tree I was constructing included a whole lot more than the lines back to the Quebec Audets, of course, and because the Audet portion was, more or less, done, I spent most of my research time on other parts of the tree, which includes 19th century immigrants from Ireland, Norway, Germany, and Belgium. When you have one line that goes back eleven generations and many other lines that strain to get past four or five you don’t spend a lot of time on the line that goes back the farthest. I shared my interest by doing things like putting together a presentation called “A Tale of Two Weddings” for the local historical society in the summer of 2010, which turned out to be my mother, Dorothy Audett Hanson’s, last summer. The presentation focused on my grandparents, Harry and Antoinette Seghers Hanson, from Chicago, who honeymooned in the Saugatuck, Michigan area, in the summer of 1910, where I live now, and my parents, Eugene and Dorothy Audett Hanson, who were married in the same area in the summer of 1940. Some of my relatives in the 19th century came from families that were originally from the United States. They lived in New York, Pennsylvania and Illinois. Later, many of them migrated West to Colorado and Washington in the 1880s and afterwards. I never did very much work on William Audett, my grandfather’s father. I knew his name, that he had worked in logging, that he had also gone West, and that he had perhaps been in Alaska during the gold rush of 1898. I knew that he had died decades before his widow, Margaret Cunningham Audett, but I never worked to find his dates. Joanne Griffin wasn’t a descendent of William Audett. She traced her ancestry to William’s brother Bernard, and then back to the Audets in Maria and Carleton-sur-Mer in Gaspé in the mid-19th century, so she never had to find any information on William for her family tree. Now and again I would find anecdotes and information about the Audetts in Seattle and I would gather those bits up and put them into my family tree. My grandfather’s sister Edna was one of the first schoolteachers in West Seattle, and the school that she taught at told about her and the school’s earliest days on its website. Another website put together by another Audet descendant listed the children of Elzéar Audet and Marie Adé (or Adeleine) Leblanc, who were my great-grandfather William’s parents in Maria. It listed William as one of their nine children. This contained an error that later led to the little mystery I refer to above. William’s widow, Margaret Cunningham Audett, and her daughters ran a hotel in the early 20th century in Port Angeles, Washington. I collected an article about the Audett Hotel written when it closed. I collected obituaries of Margaret and my grandfather’s brother, John R. Audett. Margaret’s obituary indicated my Audett relatives were buried in Calvary Cemetery in Seattle. Finally, in September, 2010 I wrote to that cemetery to try to find out something about William Audett’s dates. They told me that William had died February 26, 1921 and was sixty-seven years old at that time, making his birth year approximately 1854, and they gave me an obituary for him. And at the same time, I discovered the "Association des Descendants de Nicolas Audet dit Lapointe". I joined it, and when the newsletter Nicolas et Magdeleine arrived, I found that there was a whole set of people who were deeply and passionately interested in anything relating to the descendants of Nicolas Audet and his wife Magdeleine. My mother, Dorothy Audett Hanson, passed away in December, 2010. I decided to send her obituary off to the ADNAL newsletter. Why not tell everyone, in Québec and beyond, about the life of this daughter of the Seattle Audetts, a whole group of people about which they probably knew nothing? The newsletter decided to publish the obituary, but first, they asked Guy St. Hilaire, the vice-president and historian of ADNAL, to contact me to find out who we were, and how we needed to be connected in to what must be the mother of all family trees, the one for the entire Audet-Lapointe family. Guy sent me an email asking me, politely, since I knew I was descended from Nicolas Audet’s son Joseph, how did I know it? Who were the parents of my great-grandfather William? And what did I know about my mother’s and my grandfather’s spouses and siblings, and could I send all that on? I felt it was an honor to be quizzed by this great genealogist, and so I told him everything he asked. In passing I mentioned the website where the nine children of Elzéar Audet, farmer and fisherman, were listed, and I sent the email off. Almost instantly after that I realized there was a problem, because I discovered the 1871 Canadian census data showing the family of Elzéar, and there were only eight children. William was not listed anywhere among the children, nor was there a Guillaume or any name that could reasonably have been made into William when a young man from Quebec went to live in an English-speaking country like the United States. Guy, of course, also realized the problem. He was familiar with the data and knew that there were only eight children in the 1861, 1871 and 1881 censuses. So the little mystery was – who was William Audett really? Was he a child of Elzéar Audet? If so, who was he? For this I needed Guy. He found a Guillaume Audet’s birth records in Gaspé, and wondered if this child’s parents could be the real parents of William, but this birth was in 1865, too late for him to have been William. When he consulted Washington State’s digital death records he learned that they said that William Audett’s parents were “Elzizora Audett” and “Adeline White”. I had provided him with William’s 1921 obituary, which said, among other things, that he was the brother of Mrs. Edward Goulet (Yvonne’s mother) of Seattle and of Joseph and Bernard Audett of Maria, Québec. These two pieces of data were enough to identify William as a child of Elzéar Audet. But which one? Guy wrote me, that there was one son, Bénoni, born on May 27, 1854, who disappeared from the Canadian records after the 1881 census, and apparently had no recorded children in the Audet-Lapointe family tree. So all the data fell together, and apparently, Bénoni Audet, who went to Michigan in the United States to work in lumbering around 1882, when he was about twenty-eight years old, became William Audett. I assume that a young man with a name like Bénoni was called something quite a lot simpler in an American logging camp, like, for instance, Bill, which is a nickname for William. The little mystery was solved. A couple days later I was able to find confirming evidence from the 1900 United States census. Unlike the other censuses that have taken place in this country, in the 1900 census the enumerators asked the people they interviewed not just their age, but also their month and year of birth. This means that the 1900 family data can often be used to confirm birth and death dates from other sources, like cemetery or church data. It was hard to find data on the family, because the enumerator had listed their name as “Adett” and the indexes didn’t show them under either the original family name “Audet” or the Americanized family name “Audett”. But in 1900 the Audett family, with my grandfather, his siblings, and William’s wife Margaret Cunningham, were in West Seattle, Washington. William’s date of birth, as recorded by the enumerator, was May, 1854. 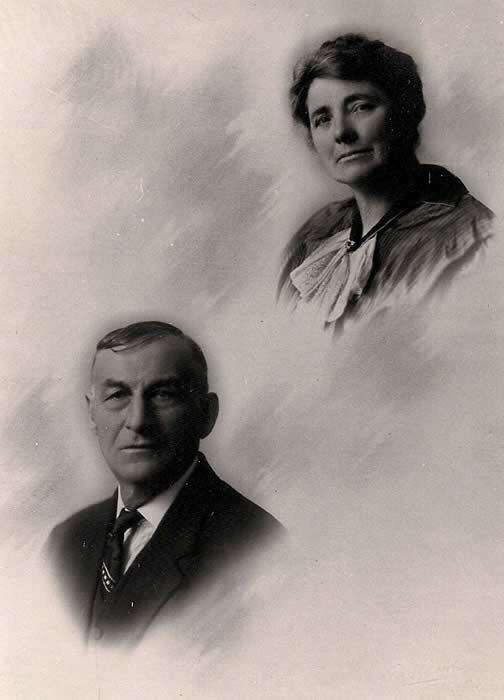 William and Margaret’s first child, John R. Audett, was born September 15, 1885 in Ludington, Michigan. I next set off to find a date for their marriage, and to try to track down Margaret Cunningham before her marriage. I knew she came from the Ottawa, Ontario area, and that her parents were Roger, or James Roger, Cunningham and Mary Sherlock. I knew that Mary Sherlock had later married a man named Peter Burnet. I had thought his given name was Sam, until I had found out his correct first name from the Calvary cemetery records in Seattle. A search through the Canadian census data for Ontario in 1881 found the family in the town of Arnprior, just west of Ottawa. Mary was thirty-four, which meant she was born around 1847. Margaret was there, along with her three brothers. A seventy-nine year old man, James Sherlock, was listed next in the census. Was he a relative of Mary? And, if so, how was he related to her? That is a question I saved to work on later. I tried to find a civil marriage certificate for William and Margaret in the various counties around Ludington, Michigan in 1883, but each county said they had no such record. I eventually thought of trying to find a church marriage record. The Diocese of Grand Rapids told me that they had placed the early marriage records for St. Simon’s Church, Ludington in the genealogical research area at the Grand Rapids Public Library. I went there, and I found a marriage record for William and Margaret on October 3, 1883, and also, a marriage record for Mary Sherlock, widow of J. Cunningham, and Peter Brunet, February 5, 1883. Guy explained some of the Latin in the marriage records. Witnesses were listed, and I misunderstood the text to mean that the parents of the bride were named. Later Guy sent along a copy of the baptism record of Bénoni Audet (later William Audett) from Carleton-sur-Mer in 1854. Everyone can’t have Guy St. Hilaire help them through problems in their genealogical research, but the way that various pieces of data fall into place to give the researcher a clear picture of the lives of his or her ancestor is the real pleasure that the study gives. At the end of it all, I hope to understand who these people were a little better, and maybe, to learn something about myself as well.